It’s the first day of school at the University of Massachusetts, Amherst, and Dr. Brian Kane is back from sabbatical. Amid the flurry of campus activity, Dr. Kane takes a break to talk about his background and work with me. Dr. Kane, the Massachusetts Arborists Association Professor of Commercial Arboriculture at UMass Amherst, is a leading figure in arboricultural biomechanics and tree worker safety, focusing his research on tree failure and gear failure. With his unassuming, casual manner, it’s surprising to know that he is one of very few people who study this complex area of the physics underlying tree failure and arboricultural practices like pruning, cabling, rigging and climbing. Brian grew up outside of New York City and remembers his early interest in trees was piqued by his dad’s Audubon Tree Guide book. He ran a landscaping business as a kid and loved climbing for a local municipal tree crew, but it took a degree in Political Science and an unsatisfactory desk job before he realized that the one constant throughout his life was that he liked trees. So he enrolled at UMass Amherst for a masters in Arboriculture and later a PhD, and he hasn’t looked back since. At the start of his academic career, Brian was interested in the strength loss formulas that predicted the likelihood of tree failure based on how much decay existed in the trunk and branches. The formulas were theoretically sound, but had not been tested for reliability in real life scenarios. What he discovered was that the formulas did not take enough variables into account for such a complex assessment. His work played a role in the development of ISA’s tree risk assessment qualification (TRAQ), which has helped to make the risk assessment process more objective. Brian’s current work is focused on arborist safe work practices where there is a deficit of research. Specifically he’s exploring the forces that occur (1) when a climber ascends into a tree and (2) in different parts of a rigging system. 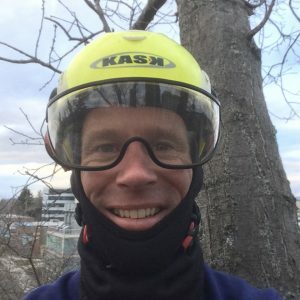 Because there are so many variables that affect the likelihood of tree failure and many different climbing and rigging techniques and tools, it’s virtually impossible to come up with a formula for the safest way to climb or rig every tree. Dr. Kane sees his work as laying the groundwork for safety improvements by helping us understand the physics underlying rigging and climbing. This knowledge allows us to identify the key points or variables for improved safety or reducing the likelihood of failure. As you might imagine, conducting arboricultural biomechanics research involves everything from people climbing trees to crunching physics and math equations. Dr. Kane emphasizes that his work is a collaborative effort, and he is grateful for all the help from his students, alumni, colleagues in the university’s Engineering school, etc. And he’s also happy to use himself as a test subject – just another reason to continue climbing trees after all these years.